G3Box (Generating Global Good), a startup company founded by a team of former and current students of Arizona State University’s Ira A. Fulton Schools of Engineering, is one of 10 finalists in the United States for the international James Dyson Awards for student innovators. G3Box, which emerged from the engineering schools’ Engineering Projects in Community Service (EPICS) program, is working to solve the problem of inadequate medical facilities in rural areas by converting freight shipping containers into medical clinics. The team provides engineering design and manufacturing for turning the large steel containers into durable, semi-mobile, stand-alone facilities for use in remote locales. “The Dyson awards are, at the core, about solving problems with new and creative ideas. We do that with a commitment to integrity, humility and collaboration,” says Susanna Young, G3Box co-founder and CEO, who earned a master’s degree in mechanical engineering from ASU earlier this year. 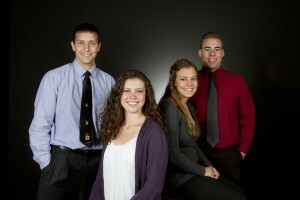 Gabrielle Palermo, Clay Tyler and Billy Walters are the other co-founders and company leaders. Tyler also earned a master’s degree in mechanical engineering earlier this year. Palermo is a senior in biomedical engineering. Walters is a senior in mechanical engineering. Their endeavor is being aided for a second year by the ASU’s Edson Student Entrepreneur Initiative based at ASU SkySong, the Innovation Center in Scottsdale, which provides funding, office space and guidance to entrepreneurial teams working to launch viable businesses. The Edson initiative is part of Venture Catalyst at ASU, a joint effort between the Office of Knowledge Enterprise Development and Arizona Technology Enterprises (AzTE) that assists students, faculty and staff, as well as local and global companies, with launching startups or accelerating existing ventures. Venture Catalyst gives G3Box and other student startups access to seasoned entrepreneurs and industry mentors. G3Box leaders plan to establish a foundation through which the company will donate a portion of profits from every medical clinic sold to providing clinics to health care organizations serving at-risk communities around the world. The James Dyson Awards are open to students in university-level product design, industrial design and engineering program, or recent graduates in those areas who have studied in the United States or 17 other countries. The winner of the award from among the finalists in the United States will be announced later this year.